SAN ANTONIO, Texas—For their dedication to advocating for agriculture and natural resources, Aaron and Amanda Low of Alto have been selected as the winners of this year’s Texas Farm Bureau (TFB) Excellence in Agriculture (EIA) contest. The Lows interact with farmers and ranchers, youth 4-H members and elementary students through educational activities. 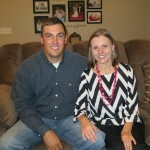 Aaron serves as a county Extension agent in Cherokee County, and Amanda is an elementary school teacher and 4-H Club manager. The couple also maintains a small herd of cattle and has two children. The couple was selected from a pool of three finalists that included Lee and Jennifer Brown of Cleveland and Jared Klatt of Bryan. The EIA contest recognizes young men and women who are involved in agriculture but do not earn their primary income directly from their own farm or ranch enterprises. The Lows will receive a $5,000 cash award, courtesy of Farm Credit; an Arctic Cat 500 4X4, courtesy of Southern Farm Bureau Life Insurance Company; a plaque and belt buckle representative of the award; and a $1,000 service voucher, courtesy of Chevrolet. They also will receive an expense-paid trip to represent Texas in the national competition at the American Farm Bureau Federation (AFBF) Annual Meeting Jan. 12-15, 2014, in San Antonio. This year’s EIA runners-up will receive a $200 power tool, courtesy of Grainger, and a new pair of Justin Boots, courtesy of Justin Brands, Inc. The winner of the AFBF Excellence in Agriculture contest will receive their choice of either a 2014 Chevrolet Silverado or 2014 GMC Sierra, courtesy of GM, and paid registration to the 2014 AFBF YF&R Leadership Conference Feb. 7-10 in Virginia Beach, Va. Three national runners-up will receive a Case IH Farmall 45A, courtesy of Case IH, and a $2,500 cash prize and $500 in STIHL merchandise, courtesy of STIHL. Media outlets: To obtain high-resolution images of the winners, please contact Jessica Domel at JDOMEL@TXFB.ORG. 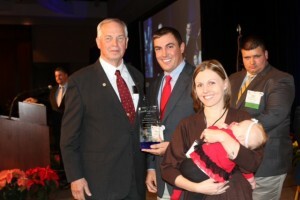 Aaron and Amanda Low of Alto have won the 2013 Texas Farm Bureau Excellence in Agriculture contest. Media Outlets: For broadcast quality video, contact Ed Wolff at EWOLFF@TXFB.ORG.